Nashville Gold and Coin Buyers offers among the most competitive rates in the industry for silver coins and silver rounds. Average circulated common date dimes, quarters, half dollars, and silver dollars minted in 1964 and earlier are commonly referred to as 90% silver or junk silver coins. These coins are recognizable the world over, are highly liquid, and are popular among coin collectors, silver bullion investors and survivalists alike. 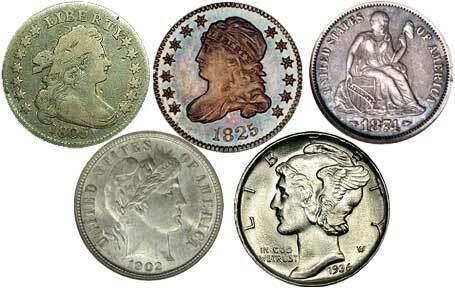 Half dollars minted from 1965 – 1970 are commonly referred to as 40% silver or half clad coins. 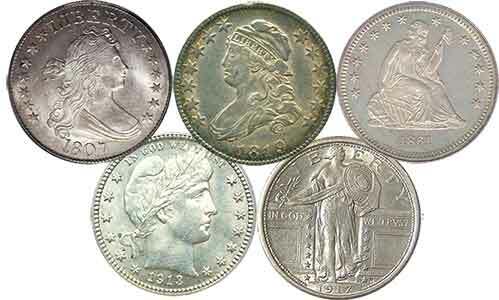 Dimes, quarters, and silver dollars minted after 1965 contain no silver content and are typically not worth much more than the face value of the coins. American silver eagles, which were first minted in 1986, and remain in production today, contain one troy ounce of .999 fine silver. These coins are U.S. legal tender and have a face value of $1. 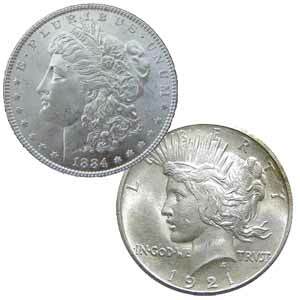 Shown in the picture above are a 1884 Morgan dollar and a 1921 Peace dollar. Weight: 31.1 g or 1 troy oz. Silver content: 99.9%, 1 troy oz. We also purchase all government issued .999 fine foreign silver coins including, but not limited to Australian Koalas, Kangaroos, and Kookaburras, Chinese Pandas, Austrian Philharmonics, Mexican Libertads, and Canadian Maple Leafs, as well as other foreign minted silver coins from these countries and others! Ready to sell your silver coins? Contact us today for a free, no-obligation assessment of your silver coins. Call 615.535.2785 now to schedule an appointment.